We tried calling for reservations a couple of days ahead but there was no answer and no answering machine. Finally got thru the day befor we wanted to be there. They did not tell us that they were on a holiday schedule and their office was only open from 10-1. An e-mail confirmation/receipt was supposed to be mailed but never was. We got there at 1:15 and fortunately, the girl there got our paperwork with our assigned site. She said if we had any questions to contact the camp host. (There was a sign at a spot, but no one there the whole time.) She tried to print out a receipt, but the printer was out of ink. The next day, we went back for a receipt and again, printer out of ink, so he e-mailed it. This time we got it. He gave us the information on the base, etc. There is no restroom/shower, or laundry but we found out we could do laundry at the Air Force Inn. It was free. The posted price was $18 but the price had gone up to $25. I would like to give ratings about 2 1/2 . Location, very little in Del Rio. Cleanliness/hospitality, grounds were clean but hospitality left a lot to be desired. 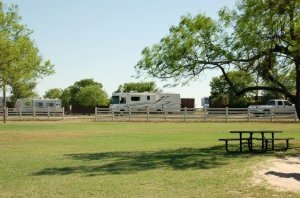 Amenities/facilities, no restroom/shower, laundry not at campground, no wi-fi. The sites are long and level. Value, for the previous $18 it would have been fine but for $25, not really worth it. Overall experience, could have been better. Very noisy with training but that is to be expected. Pet cleanup was not enforced. Watched a man walking two big dogs behind us an he didn't clean up after them.